The R-PLEX Human MIP-4 Antibody Set includes a matched capture and detection antibody pair and calibrator for the quick and easy measurement of MIP-4 in biological samples. R-PLEX products leverage MSD’s electrochemiluminescence technology for better sensitivity and a larger dynamic range than traditional ELISAs. R-PLEX matched antibody sets enable the development of singleplex and multiplex immunoassays. Individual assays may be developed using MSD avidin- or streptavidin-coated plates. Custom multiplex assays with any combination of R-PLEX analytes, as well as R-PLEX plus U-PLEX analytes can be developed on U-PLEX MULTI-SPOT plates. To learn more about the advantages of R-PLEX products click here. 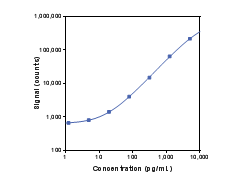 Calibration curve for the R-PLEX Human MIP-4 Antibody Set was assessed and representative data is presented below. Description - Macrophage inflammatory protein 4 (MIP-4) (CCL18/PARC/AMAC-1/DC-CK-1/SCYA18) is a C-C chemokine strongly expressed in the lung and to a lesser extent in the thymus and lymph nodes. To date, the functional receptor and role of MIP-4 has been difficult to ascertain as it appears to exist only in primates, rendering rodent models unusable. MIP-1α is the most closely related chemokine to MIP-4, but CCR1 and CCR5 (of which MIP-1α is a ligand) do not bind MIP-4. In vitro, MIP-4 is particularly chemotactic for naive T-lymphocytes, Th2 cells, B cells, and immature dendritic cells. Despite MIP-4’s absence in rodents, it is functionally active in humans as a T-lymphocyte chemoattractant. MIP-4 involvement has been implicated in tumor malignancy and various inflammatory and allergic pulmonary, skin, and joint diseases. MIP-4 is also expressed in abundance in tumor-associated macrophages found in breast tissue and is associated with increased breast cancer metastasis. MIP-4 is thought to cause increased ECM adherence of cancerous cells to fibronectin in the stroma allowing subsequent invasion.